Doctor Who Series 11 Trailer Released! Check out the brand new official trailer for Doctor Who Series 11 released at SDCC 2018, staring Jodie Whittaker as the new Doctor! 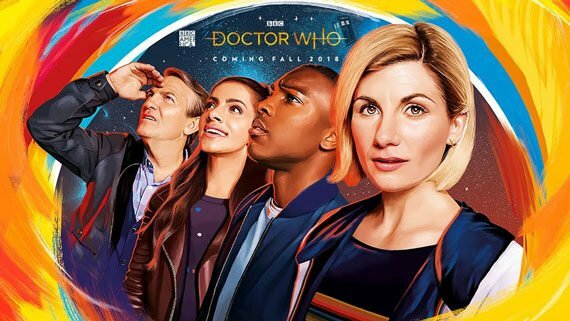 As we see in this exciting trailer the 13th Doctor will be joined in her adventures by a regular cast of new friends, including Bradley Walsh as Graham, Tosin Cole as Ryan, and Mandip Gill as Yasmin. I think its a great trailer. 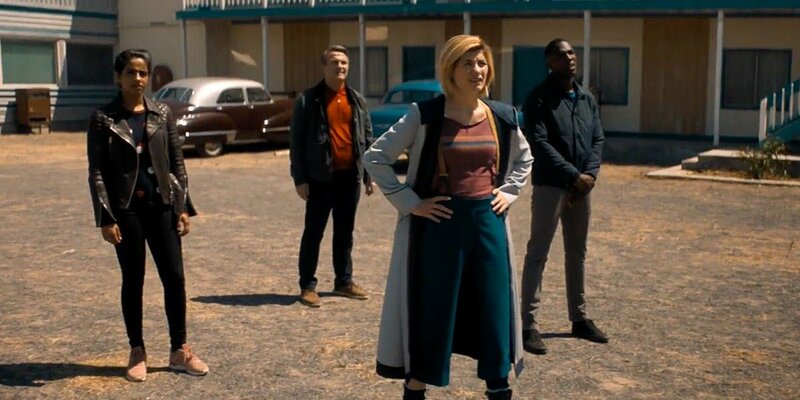 Really looking forward to Series 11, no doubt new showrunner Chris Chibnall will have plenty of surprises in store for us, and I can’t wait to for the 13th Doctor and her friends all-new adventures in Time and Space to begin! Doctor Who Series 10 Trailer Released! Check out the awesome new Doctor Who Series 10 trailer! 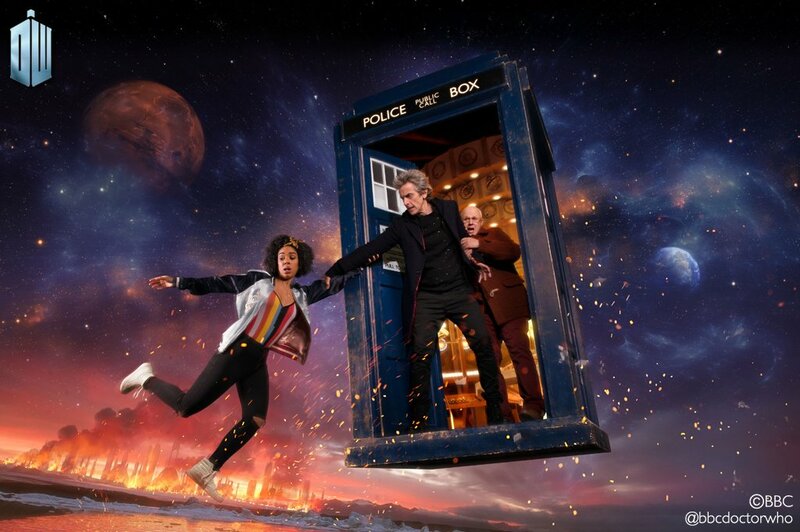 Staring Peter Capaldi as the Doctor, with Pearl Mackie as new companion Bill, along with Matt Lucas as Nardole, Doctor Who Series 10, begins on Saturday 15th April 2017! I think it’s a great looking trailer, lots of locations and monsters, can’t wait for the new series! Get ready for a festive treat of super-powered adventure in this year’s Doctor Who Christmas Special: The Return of Doctor Mysterio, as the Doctor (Peter Capaldi) returns for Christmas Day and teams-up with a bullet proof comic book superhero, The Ghost, to save New York from menacing brain switching aliens! 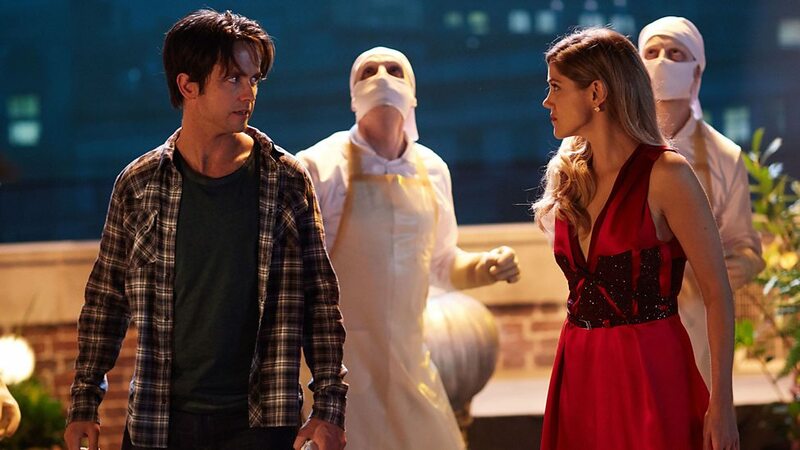 When a boy called Grant (Logan Hoffman), is given superpowers, the young comic book fan grows up to be the geeky Clark Kent-esque Grant Gordon, played by Justin Chatwin (Orphan Black, War of the Worlds, and the US version of Shameless), and becomes the caped vigilante know as The Ghost. But he finds balancing life as a superhero and maintaining a secret identity isn’t easy, especially when the Lois Lane of his life investigative journalist Lucy Fletcher (Charity Wakefield from Wolf Hall and The Player) gets caught up in his madcap superhero world, and there’s even the mysterious high-tech Harmony Shoal corporation with a ruthless Lex Luthor style villain fronting an alien invasion for the Doctor to contend with as well! 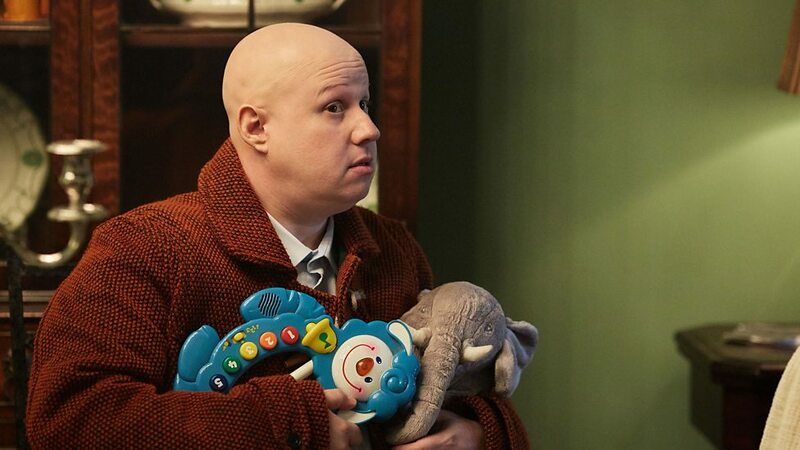 The Doctor and his new travelling companion Nardole, played by Matt Lucas (Little Britain), who has inexplicably returned to accompany the Time Lord after literally loosing his head to a despot robot last Christmas, arrive in New York and soon joins forces with Lucy Fletcher and the Ghost to save Manhattan as aliens prepare to attack, but what secrets will be revealed this Christmas when we see behind the Ghost’s mask..? Doctor Who finally returns to our TV screens for this first time this year with The Return of Doctor Mysterio. This special 60 minute Christmas Special, written by Stephen Moffat and Directed by Ed Bazalgette (Director of Series 9’s The Girl Who Died and The Woman Who Lived), provides a glittering blend of superhero action and Whovian Christmas cheer! Essentially a fond homage to the comic book genre, particularly Richard Donner’s Superman films staring Christopher Reeve, this Doctor Who-Superhero mashup delivers a fittingly exciting and action-packed adventure. Indeed, the Doctor Who Christmas specials have now become something of a major highlight in the TV schedules since the programmes revival in 2005, and given that this is the first chance we’ve had to catch up with the Doctor this year the anticipation levels for this year’s Doctor Who Christmas special has been heightened even further! 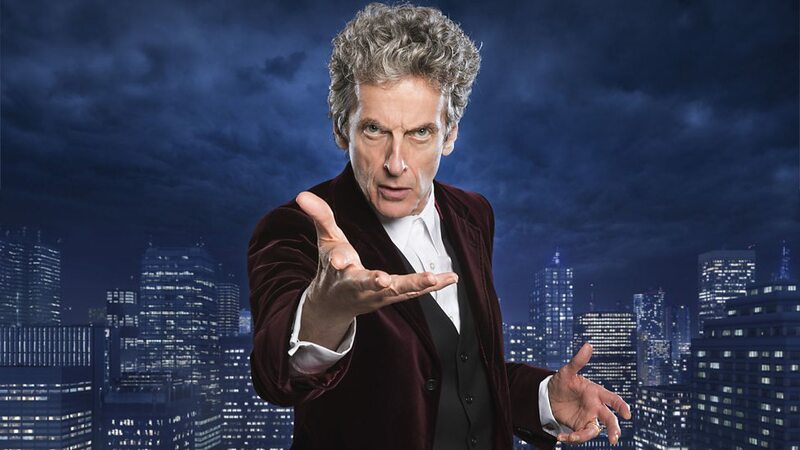 Peter Capaldi is on fine form as the 12th Doctor. His incarnation of the Time Lord dominates every scene, with his stylish and commanding presence, along with a no-nonsense attitude that’s now tempered with a wry dash of humour, he also seems to have gained a taste for sushi now, and acquired a new companion since we last saw him. 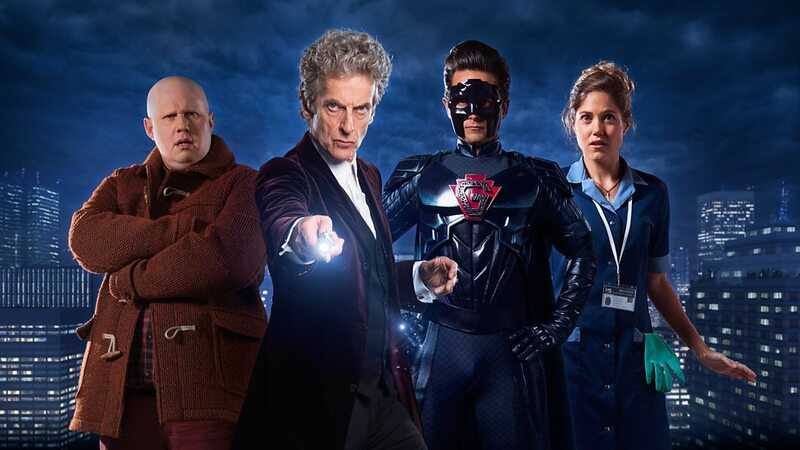 Yes, Matt Lucas is back reprising his role as Nardole from 2015’s Christmas Special: The Husbands of River Song, and he’s already travelling with the Doctor when we first meet him in this episode. Nardole is also the first non-human companion the Doctor has travelled with for some time. The Return of Doctor Mysterio vaguely explains how the Doctor somehow restored Nardole after he was decapitated and trapped inside Hydroflax in The Husbands of River Song, and why he’s now travelling with the Doctor in the TARDIS, and no doubt Nardole’s story will be explored in greater detail in Series 10 next year. There is a great supporting cast in The Return of Doctor Mysterio. Justin Chatwin is brilliant as the dorky live-in-nanny Grant Gordon, Charity Wakefield is also excellent as Daily Chronicle reporter Lucy Fletcher, and there’s a delightful Superman movie style – Lois and Clark TV series vibe woven through Moffat’s script that plays out between these two characters which forms the basis of some of this Christmas specials most enjoyable scenes. 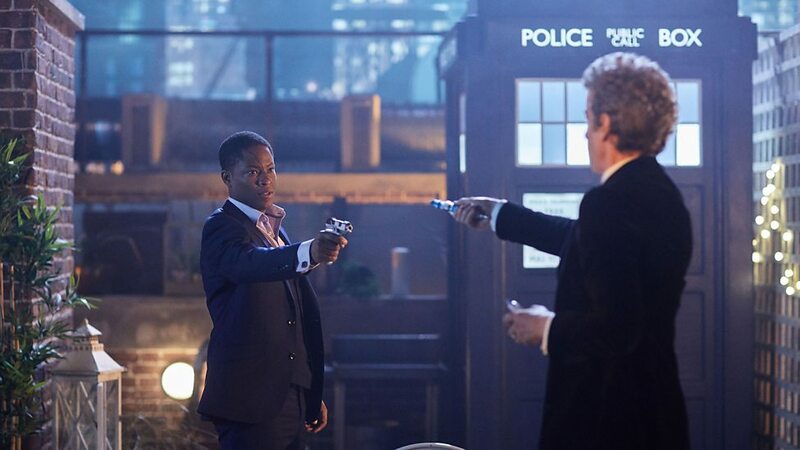 There are also great roles for Aleksandar Jovanovic as the sinister Dr Sim, who is accompanied by Tomiwa Edun as Mr Brock, and an especially fine performance from Logan Hoffman as the young Grant who has some brilliant scene with the Doctor – especially when they talk about comic books. Of course there is a sinister alien plot to take over the world to be stopped in The Return of Doctor Mysterio which the Doctor seemingly stumbles into that just happens by chance to involve the same superhero that he also inadvertently created – which certainly throws some timey-wimey complications into the mix! The monsters that feature in this Christmas Special are themselves fairly new to the series, but we have seen them before. The Brains and Harmony Shoal are in fact the same multi-nucleate organisms akin to The Shoal of Winter Harmony; the head-splitting Aliens we last saw in the Husbands of River Song. The Brains stored in the New York Harmony Shoal building – like those in other key strategic points located around the world – are waiting for compatible host bodies, like Dr Sim and Mr Brock to become “vehicles” for the Brains to use. Indeed, the distinctive diagonal scar down their face, eyes that glow occasionally, along with a tendency to seep blue liquid, is the only thing that gives them away. The scene where a terrified Mr Brock is about to be surgically possessed by one of the Brains is genuinely chilling, and the split-head effect we see employed later is also especially gruesome. These aliens take body horror to a whole new level, its used to great effect throughout this story, and their plan to crash their spaceship into New York so they can possess world leaders as they take refuge in Harmony Shoal’s facilities is a warped stroke of genius when it comes to invasion plans. 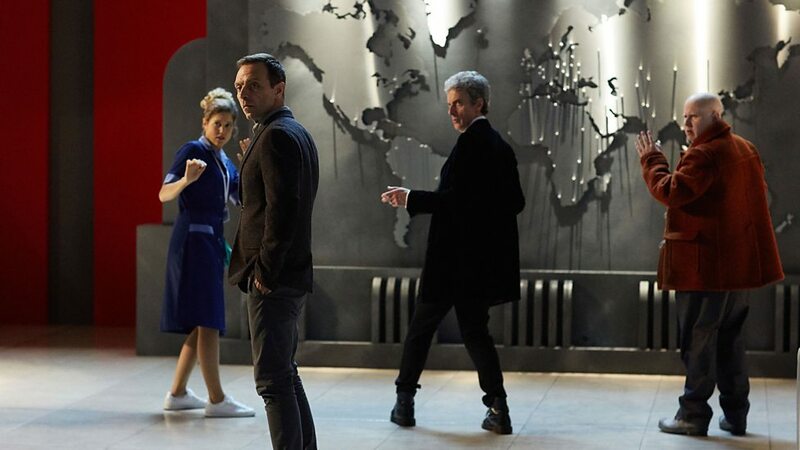 Although most of The Return of Doctor Mysterio was filmed Wales, there were also a few days filming in the Nu Boyana Film Studios in Bulgaria, with their magnificent standing New York sets doubling for the Big Apple. The episode features some truly remarkable special effects magic which completes the illusion and brings the iconic New York setting to life for this story. The Ghost, with his classic style superhero costume and art deco chest emblem, and his powers, especially the flying sequences, are all well realized on screen. The Brains with their little eyes and the split-face effects uses for Dr Sim and Mr Brock are also impressive and imaginatively done. However, surprisingly for a Doctor Who Christmas Special The Return of Doctor Mysterio isn’t exactly the most Christmassy looking episode the series has done. Apart from one scene Christmas hardly features at all, but in other, more subtle, and emotional ways this episode with its themes of loss, hope, and new beginnings, actually ends up feeling like the most emotional Christmas episode of all. This is also Doctor Who’s first real take on the superhero genre. Peter Capaldi clearly relishes the chance to do something new with the character of the Doctor here. After all, in many ways, the Doctor is a superhero of sorts, like Superman he’s an alien, has tremendous powers, at certain points he has also been tragically the last of his kind, so its perhaps no surprise when the eight year old grant names him as the erstwhile Doctor Mysterio – which is in fact the translated title Doctor Who in Mexico – of this Christmas specials title. 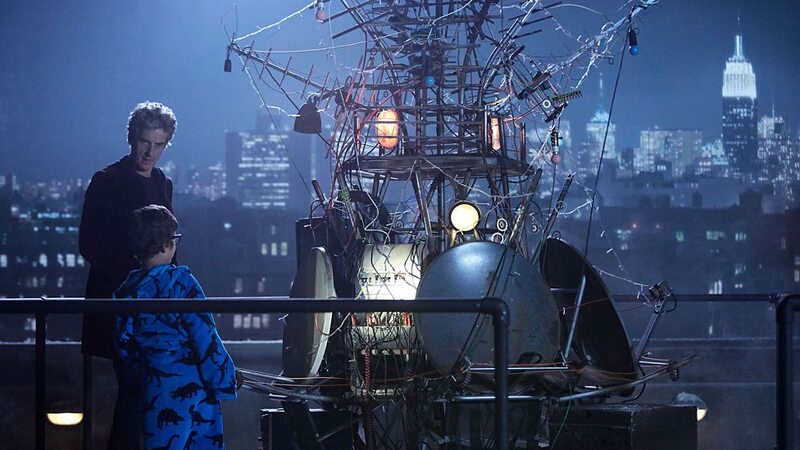 The Return of Doctor Mysterio only really goes off kilter slightly in the last act, with the Doctor and Nardole trapped on a spaceship about to crash into New York, while Grant and Lucy are trapped by Mr Brock and his team of surgeons who have set their sight on acquiring the Ghost’s body for one of the Brains of Harmony Shoal. 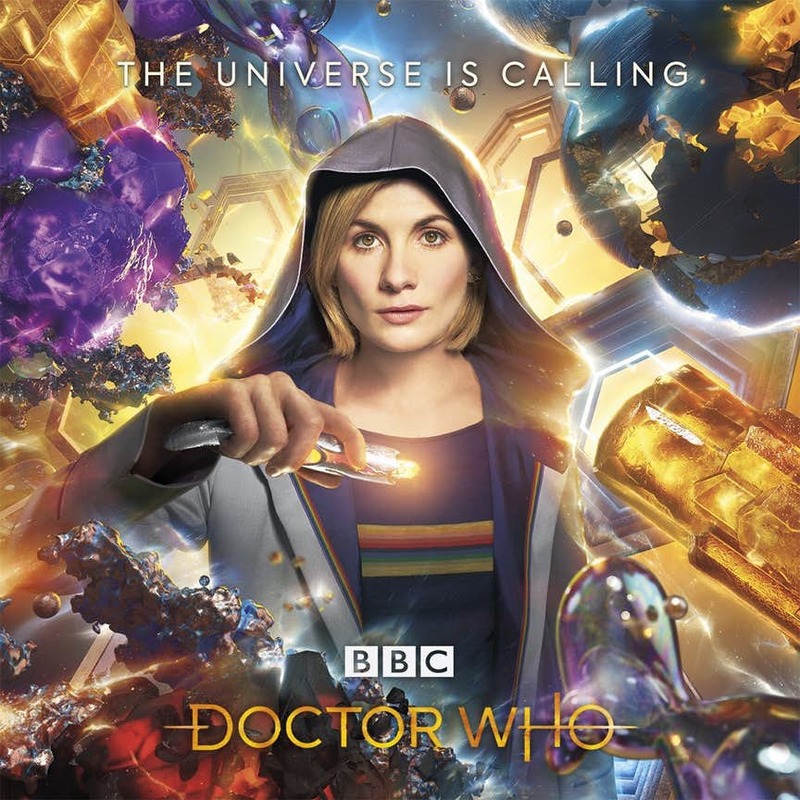 The conclusion is fittingly heroic and romantic, there’s brilliant closing speech from the Doctor that will melt your heart, and a moving finale scene and story from Nardole that provides a beautiful coda for The Husbands of River Song. Steven Moffat has done a brilliant job with the script for The Return of Doctor Mysterio, its fun, exciting, it also provides some emotional closure for the Doctor concerning River’s death, and it’s peppered with loads of comic book Easter Eggs that are sure to raise a wry smile or two! I’ll admit I was extremely sceptical when I heard Matt Lucas was returning as Nardole. River Song’s former helper was fine as a one-off character in The Husbands of River Song, but I couldn’t see how the character really warranted a return in The Return of Doctor Mysterio – let alone as part of the cast for Series 10! Thankfully I couldn’t have been more wrong! Matt Lucas gives a delightfully understated performance as Nardole in The Return of Doctor Mysterio. His banter with the Doctor is fun, but not too over the top. I was surprised that Nardole can fly the TARDIS now, but it certainly came in handy in this episode for the Doctor. Nardole’s reasons for being with the Doctor are especially poignant, he’s far from being just the one-note comedy character we might have envisaged, and Lucas proves to be a revelation in the role. Final word must go to Peter Capaldi and his magnificent performance as the Doctor. The grouchy rough edges of this incarnation have now significantly mellowed. Capaldi has now undoubtedly made the role his own. His sheer dedication and love for Doctor Who shine though in every scene. The Return of Doctor Mysterio also gave us an insightful trailer for Series 10 to enjoy, it looked amazing, and I’m certainly looking forward to seeing new companion Bill joining the Doctor and Nardole on their new adventures in time and space. The Return of Doctor Mysterio sets us on course for Series 10 in Spring 2017, beginning Steven Moffat’s final season as show runner, which will star Peter Capaldi as the Doctor, with Pearl Mackie as new companion Bill, along with Matt Lucas as Nardole. Steven Moffat’s run concludes with next year’s Christmas special, before work begins on Series 11 and Chris Chibnall takes over as Doctor Who’s new show runner. With its excellent cast and extremely high production values The Return of Doctor Mysterio was a great Christmas Special, its one of my favourites now, and I can’t wait to see what adventures Series 10 will bring! And here’s the trailer for Series 10!